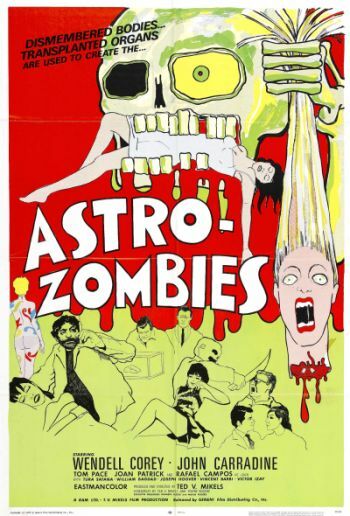 I am ashamed to say I had never heard of The Astro-Zombies (1968) until my husband stumbled across it one night. Wendell (Hic!) Corey? John Carradine? Tura Satana? I’m a fool for never having watched this movie! Oh, this is a terrible movie, though. I felt downright depressed after watching Wendell try to get through his lines without slurring, and there’s one moment in the film where an agent at the government organization Corey works at says he’s been forced to investigate at bars so much he’s about to turn into a lush. There is a lingering reaction shot on Corey that is so very, very uncomfortable. Corey died less than six months after this film was released, of alcoholic liver disease, at the age of 54. 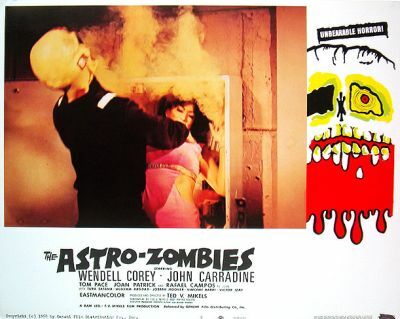 The Astro-Zombies concerns one Dr. DeMarco (John Carradine, being a complete hambone, as expected) created an “astroman” from the body of a dead criminal. It’s part of his plan to get back at “the space agency” for firing him, because he is insane. The astroman quickly becomes a liability, starts to kill innocent people (because it’s fun!) and the rest is, as they say, history. In 1968, director Ted V. Mikels gave us both Astro-Zombies and the MST3K staple Girl in Gold Boots, and both films share some of the same cast, most notably Tom Pace. Pace is probably (and unfortunately) best known as Buz from GiGB because of the MST3K riff “I’m an icky elf!” Pace, however, is not that bad of a low budget movie actor. His reputation seems to be based entirely on the MST3K riffs and that’s a shame. Most MST3K fans (and, if interviews are to believe, some of the writers and performers on the show) loathe bad movies, which is probably why people who love Z-grade low budget flicks often don’t care for MST3K. I often feel like I’m straddling a philosophical fence by loving MST3K and bad movies, and I do get really irritated when I see someone like Pace reduced to nothing but “icky elf” online. I didn’t have a good picture of Tom Pace, so I hope Tura Satana will do in his stead. 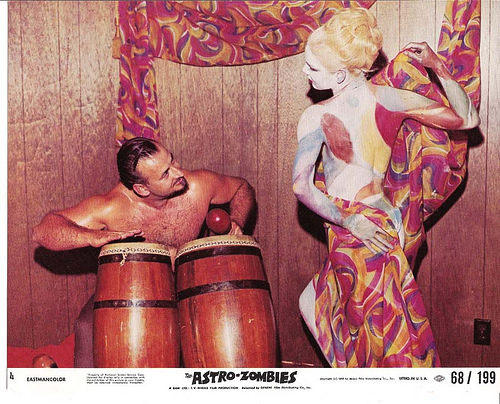 The problem with Astro-Zombies is that, like so many indie quickies of this era, it puts the actors through actions that do not make even an ounce of sense. Screams and gunshots that are obviously easy to hear are ignored. Doors are left unlocked. Traps are set that wouldn’t work even if they had been executed by people who knew what they were doing. There are a few redeeming factors. One is John Carradine who, bless his heart, tries his damndest to instill some kind of logic to his mad scientist role. His sidekick Franchot (played by William Bagdad) has a few honestly funny facial expressions; I was particularly fond of Juan’s evil side-eye, too. Also, at the end when a solar-powered astro-zombie loses his recharging panel (true story), he is forced to grab a flashlight and hold it to his forehead for the rest of the film. Pure Z-grade gold. Tomb of Anubis’ review, where he refers to the lady in the opening credits as being killed “by some goofball in a bad Halloween mask wielding a weapon that looks like a trowel duct taped to a hand tiller.” He’s not wrong. Next Post Recently Watched: The Laughtoniest! Brilliant low-budget goodness! I found that point you brought up about MST3K interesting. I love that show with all my heart, but I’m no cheapie hater by any definition. Maybe it’s because I like to think that my sense of humor allows me to appreciate a Z-grade film but still allow room for fun-poking. Or maybe I’m just crazy. Love that you brought up the flashlight bit! Don’t forget the parts where the night scenes inexplicably transition to afternoon sunshine. =) Wonderful review. I’m quite a fan of Ted V. Mikels although I haven’t seen that one yet. I adored Girl in Gold Boots. It’s the Citizen Kane of go-go dancing movies. Cool post! I’m wondering if you know that there’s a new Astro-Zombies movie out, Astro-Zombies M3: Cloned? (No official site per se, linking to the page with the most info. ; see also Ted’s official site.) Also there’s a new documentary about Ted which has interviews with him, Tura Satana etc., and they talk about the original Astro Zombies: The Wild World of Ted V. Mikels. Ted and Tura are still friends and still making silly movies — what fun! Incredibly, I have seen most of Ted’s movies, but never this, maybe his most famous creation, although I have seen clips of it. It’s on Netflix on demand right now so I can rectify that. BTW Ted lived in a castle of sorts at the time (or close to it), with a harem of women, including Tura at one point. That’s a pretty studmuffin-y way of going about your business, so to speak. Wendell (Hic!) Corey. I hurt myself laughing every time you write that.